This is the home page of Oxquarry Books Ltd. For a list of what is currently available on our websites, please see below. For the postal address see below. Please copy and paste the above and delete one of the @s and include the word 'Query' in the subject line. Many thanks. Please copy and paste the above address into the address line of your email and delete one of the '@'s. Include the word 'Query' in the subject line. A superb book which explores the close relationship between Southwell and Shakespeare. There are more verbal parallels, echoes and borrowings from Southwell by Shakespeare than from any other author, not excluding Holinshed and North (Plutarch). 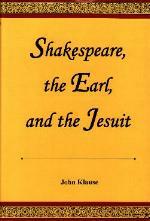 On the basis of John Klause's discoveries much of Shakespearean biography will have to be rewritten. I highly recommend this book to all those interested in Shakespeare's inner life. The book is unfortunately out of print. But it is available in full on line here on the Sonnets web site. Click here for further details. Marlowe in Henry V : a Crisis of Shakespearian Identity? An original work by Dr. Thomas Merriam on the conflict of themes in Shakespeare' Henry V, militarism versus humanism. 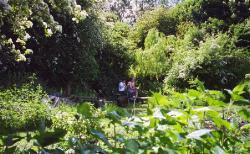 Spragglesea Mead and Dean's Ham Allotment Association web site. St. Michael's Church, Cumnor, Oxfordshire. Click on the icon below to see detailed statistics of visitors to this web page. TOP Copyright of all items published on these websites belongs to OXQUARRY BOOKS LTD.
Enquiries concerning copyright may be sent to the email or postal address below. Registered Office: 27 Western Road, Oxford, OX1 4LF, UK. Please copy and paste the above and delete one of the @s . Please put the word Query in the subject line. Copyright © 2001-2014 of this site belongs to Oxquarry Books Ltd. This page last updated Nov. 23rd 2014.